James Ward (1769–1859), Man Struggling with a Boa Constrictor, Study for "Liboya Serpent Seizing its Prey" (c 1803), oil on canvas, 83.8 x 119.4 cm, Yale Center for British Art, New Haven, CT. Wikimedia Commons. John Constable (1776-1837) and JMW Turner (1775-1851) are now generally recognised as being the major figures in British painting in the first half of the 1800s. At the time, critics would have added at least a third major figure, who was as popular, innovative, and far more versatile: James Ward (1769–1859). Although slightly older that Constable and Turner, all his significant works were painted after 1800, and the short-lived tragic genius George Morland – Ward’s brother-in-law – died in 1804. Like Turner, James Ward was born of a relatively poor family in London. His father was a cider and fruit merchant, who unfortunately fell victim to excessive cider consumption, leaving his mother destitute. His older brother managed a good education and became a leading engraver, but James was put to work filling bottles of cider, then washing bottles, rather than being sent to school. He started his apprenticeship as an engraver with the leading engraver of the day, John Raphael Smith, in 1781 or 1782, just as brother William was completing his apprenticeship. When he was an apprentice, his talent for drawing became apparent, and James was producing plates in his own name from 1784. At around that time, he first came into contact with George Morland, who at that time was at the height of success and relatively free of debts and drink. Morland married Anne Ward (James’s sister) in July 1786, and a month later William Ward married Maria, Morland’s sister. Although the joint household of the Morlands and Wards lasted only three months, William and James Ward remained good friends with George Morland, and this enabled James Ward to start to learn to paint in oils. In 1791, when his apprenticeship as an engraver completed, Ward wanted to become Morland’s pupil, but the irascible Morland refused. Ward continued to teach himself, largely by copying Morland’s paintings and other works which came in for him to engrave. By 1793, Ward had sold some of his more original paintings of rustic scenes, and made engravings from them, which he published. In about 1793, he had his first four paintings accepted for exhibition at the Royal Academy, and his paintings and engravings were earning him a good income. Soon after that, Morland fell out with him, something which Ward came to value as Morland’s debts and problems mounted. Ward himself had periods when the stress of life seemed to overcome him: in 1794, with the outbreak of war with France, he lost a lucrative market for his prints. However, he fell in love with Emma (or possibly Mary Ann!) Ward (who was unrelated), and married her in early December. James Ward (1769–1859), A Border Leicester Ewe (1795-1800), oil on canvas, 31.1 x 37.5 , Yale Center for British Art, New Haven, CT. Wikimedia Commons. 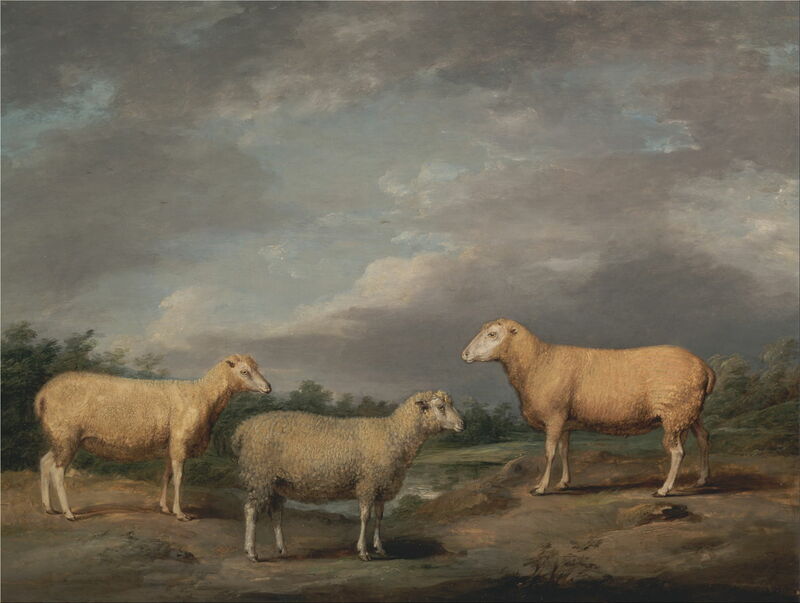 Ward’s early paintings were greatly influenced by Morland, and showed farm animals, such as his A Border Leicester Ewe (1795-1800), and rustic scenes. This particular breed, which today at least has rather larger ears, was developed in Northumberland, England, in 1767, so was a recent introduction when Ward painted this ewe. 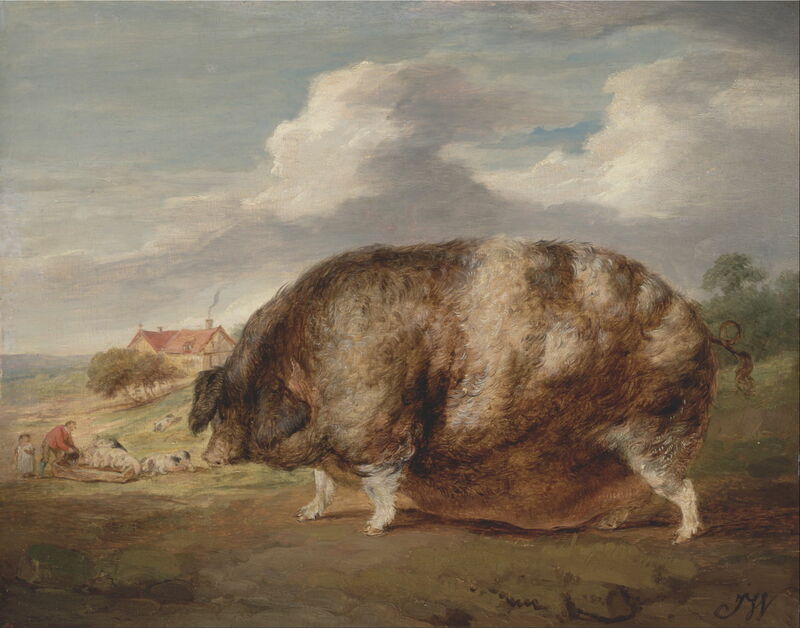 This painting was probably part of an uncompleted commission to travel around the whole of Britain documenting its farm breeds for the Agricultural Society, which he undertook from 1800. His paintings were to be engraved and published by Josiah Boydell, but the project foundered in 1805-7. James Ward (1769–1859), The Reapers (1800), oil on canvas, 46 x 61.6 cm, Yale Center for British Art, New Haven, CT. Wikimedia Commons. 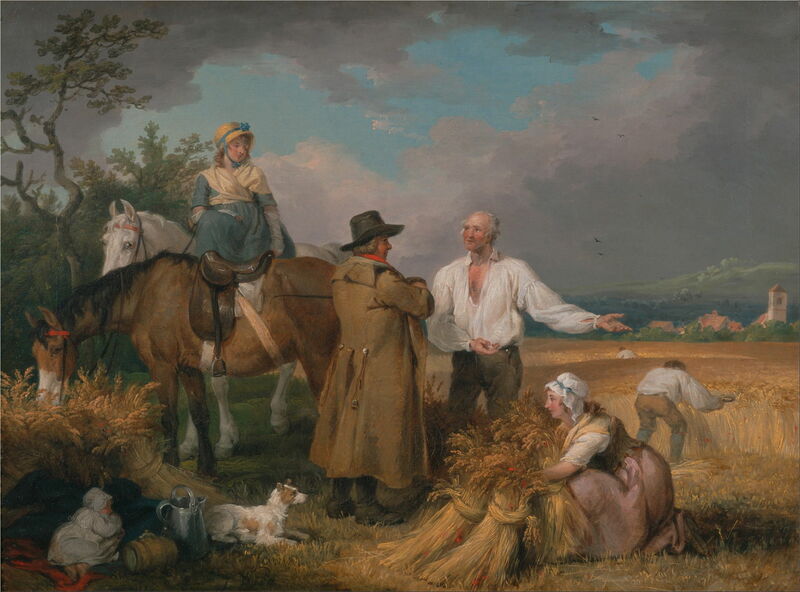 The Reapers (1800) has similar influence, showing the landowner and his wife, who have ridden out to inspect progress with the harvest. Behind them, Ward’s landscapes soon became much more than mere backdrops to his figures and animals, with careful play of the light from his subtle sky, on the fields, hills, and distant village. James Ward (1769–1859), A Harvest Scene with Workers Loading Hay on to a Farm Wagon (c 1800), oil on panel, 11.4 x 20 cm, Yale Center for British Art, New Haven, CT. Wikimedia Commons. Though his early finished paintings may have lacked originality, he produced some superb oil sketches from early on, which bear comparison with those of Constable. 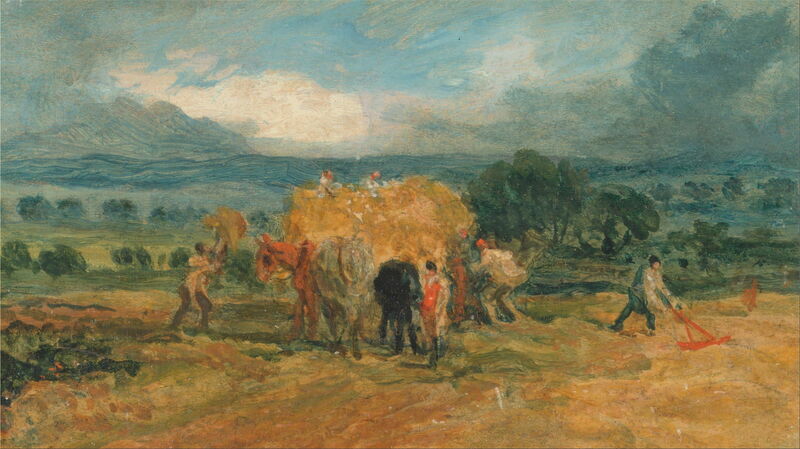 A Harvest Scene with Workers Loading Hay on to a Farm Wagon (c 1800) was painted on a small panel, using high chroma colours, particularly in the foreground. James Ward (1769–1859), Gloucestershire Old Spot (1800-1805), oil on panel, 29.8 x 38.1 cm, Yale Center for British Art, New Haven, CT. Wikimedia Commons. Gloucestershire Old Spot (1800-1805) takes one of Morland’s favourite farm animal subjects, this ancient but now threatened breed, and plants its enormous bulk into another of Ward’s delightful rustic landscapes. 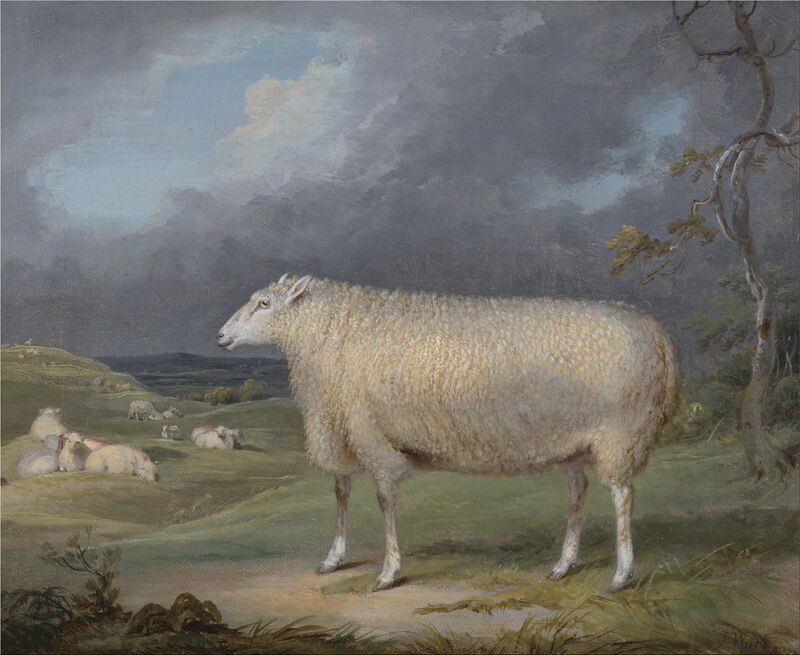 James Ward (1769–1859), Ryelands Sheep, the King’s Ram, the King’s Ewe and Lord Somerville’s Wether (1801-1807), oil on panel, 45.1 x 61.6 cm, Yale Center for British Art, New Haven, CT. Wikimedia Commons. Ryelands Sheep, the King’s Ram, the King’s Ewe and Lord Somerville’s Wether (1801-1807) shows faithfully one of the oldest breeds of British sheep, which originated with the monks of Leominster, Herefordshire, in the 1300s. Their name is derived from their being grazed on rye pastures. Although Ward returned to farm animals as his subjects, this marks the end of his early period of painting influenced by Morland. James Ward (1769–1859), Man Struggling with a Boa Constrictor, Study for “Liboya Serpent Seizing its Prey” (c 1803), oil on canvas, 83.8 x 119.4 cm, Yale Center for British Art, New Haven, CT. Wikimedia Commons. Ward’s outstanding Man Struggling with a Boa Constrictor (c 1803) was a relatively large and late oil study for a painting which was apparently rejected by the Royal Academy in 1803, Liboya Serpent Seizing its Prey, which has been lost. 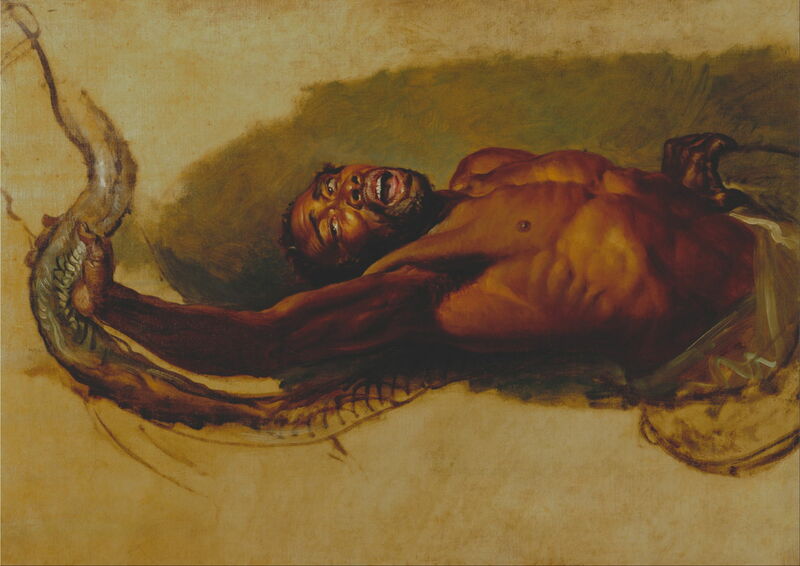 It is probably his best figure painting, showing careful study of anatomy: although Ward never attended the Royal Academy Schools, unlike Turner, in 1801 he enrolled in an anatomy course by dissection in London. Ward had applied to the Royal Academy Schools in 1797, but was unsuccessful; Turner had started his studies there in 1789. James Ward (1769–1859), Landscape near Swansea, South Wales (c 1805), oil on panel, 11.7 x 30.5 cm, Yale Center for British Art, New Haven, CT. Wikimedia Commons. He continued to sketch landscape views in oils, among which one of his most outstanding is his panoramic Landscape near Swansea, South Wales (c 1805), squeezed onto a small panel. The extensive smoke rising from the distant valley was from the heavy industries based on coal and iron which had been spreading through the previously rural areas of South Wales. James Ward (1769–1859), An Overshot Mill (1802-1807), oil on panel, 27.6 x 33.3 cm, Yale Center for British Art, New Haven, CT. Wikimedia Commons. 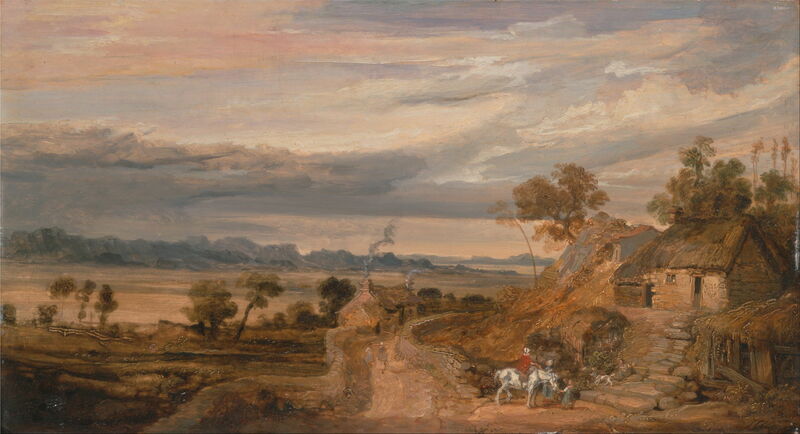 Unlike Constable’s affluent paintings of Suffolk, Ward was not shy of showing the increasing dereliction in the troubled countryside at the time. His An Overshot Mill (1802-1807) shows a watermill using the combination of water and gravity to power the grinding of corn. Its fabric is in dire need of repairs, and the thatchers have already made a start on its roof. James Ward (1769–1859), Landscape with Cottages (1802-1827), oil on panel, 24.1 x 43.8 cm, Yale Center for British Art, New Haven, CT. Wikimedia Commons. Landscape with Cottages (1802-1827) is more idyllic, but still has the frankness of an oil sketch, under its richly coloured sky. 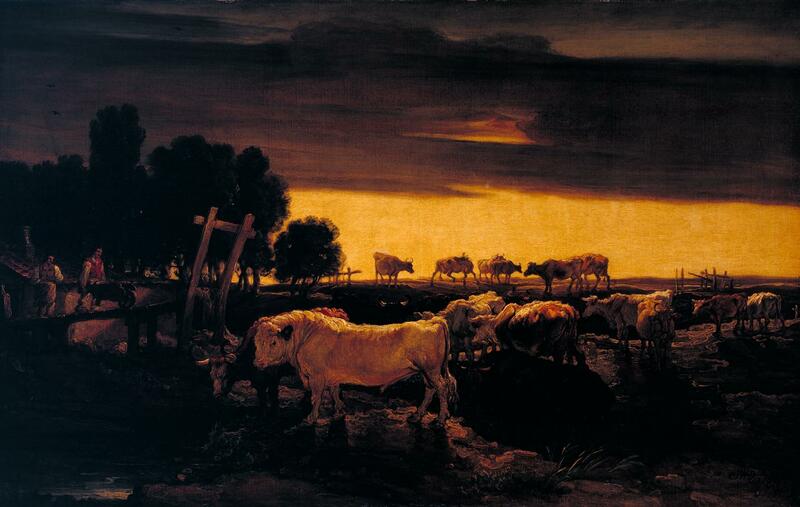 At a time when Turner’s oils were still quite conventional, Ward experimented more with light, as in his unusual Cattle-Piece, ? Marylebone Park (1807). This is also of interest in that it is believed to be set in what was then a large hunting park on the northern edge of London, whose modern relic is Regent’s Park. James Ward (1769–1859), Rough-Coated Collie (1809), oil on board, 25.4 x 40.6 cm, Yale Center for British Art, New Haven, CT. Wikimedia Commons. 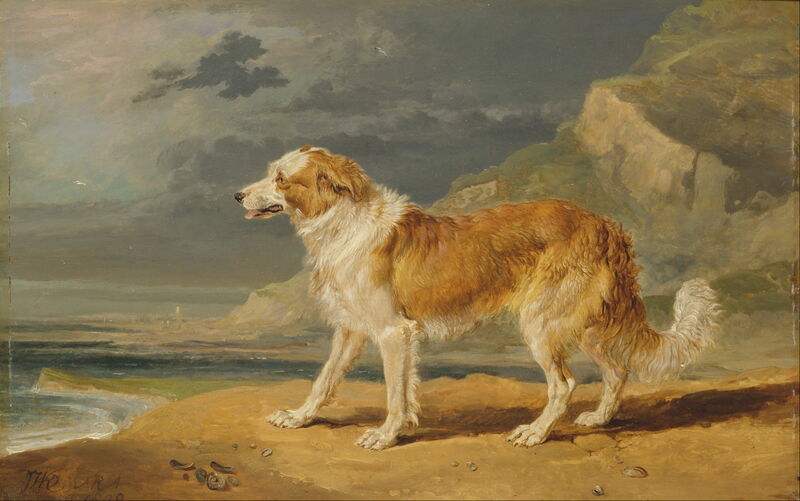 Even when he was painting portraits of dogs, Ward could not resist setting them in fine landscapes complete with brilliant seagulls, as shown in his Rough-Coated Collie (1809). This dog appears to be a shorter-haired precursor to the modern Rough Collie, which originated in the 1800s, perhaps with a cross with a Borzoi or Russian Wolfhound. 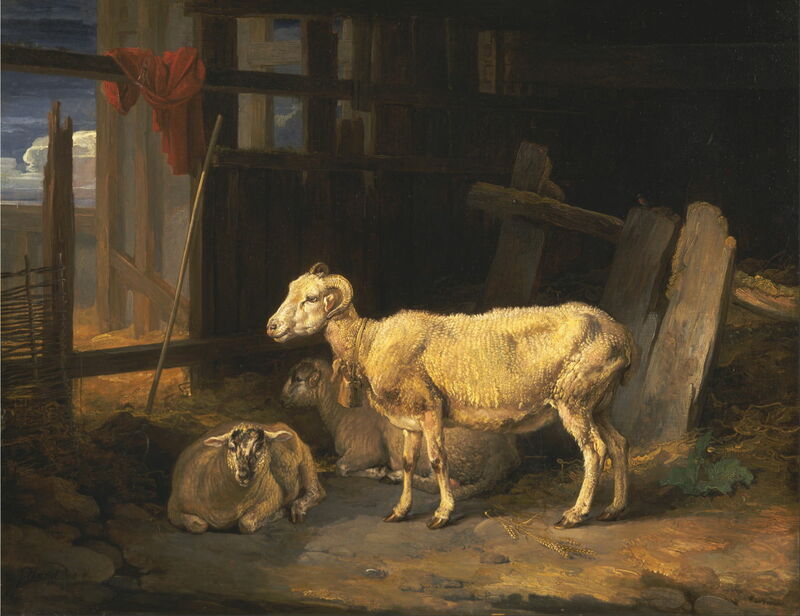 James Ward (1769–1859), Heath Ewe and Lambs (1810), oil on canvas, 71.4 x 92.4 cm, Yale Center for British Art, New Haven, CT. Wikimedia Commons. Ward’s Heath Ewe and Lambs (1810) is unusual for its indoor setting, and the difficulty in recognising the breed, which appears to be a horned heath variety, which were probably confined to Germany at the time. It is also hard to know whether to read anything into the red cloak wrapped around the wooden beam at the top left. James Ward (1769–1859), The Straw Yard (1810), oil on panel, 19.1 x 29.2 cm, Yale Center for British Art, New Haven, CT. Wikimedia Commons. 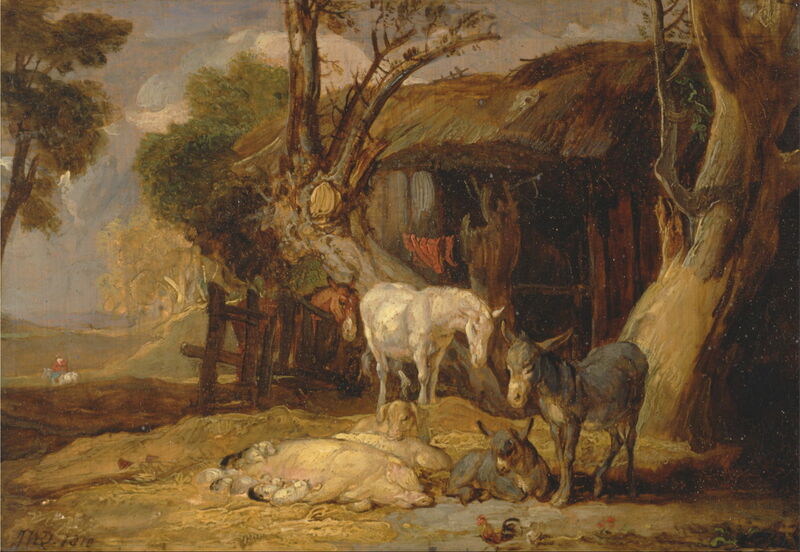 The Straw Yard (1810) is a wonderfully loose sketch in which Ward brings together the dereliction in the countryside, and a menagerie of farm animals, including horses, two donkeys, chickens, and many pigs and piglets. 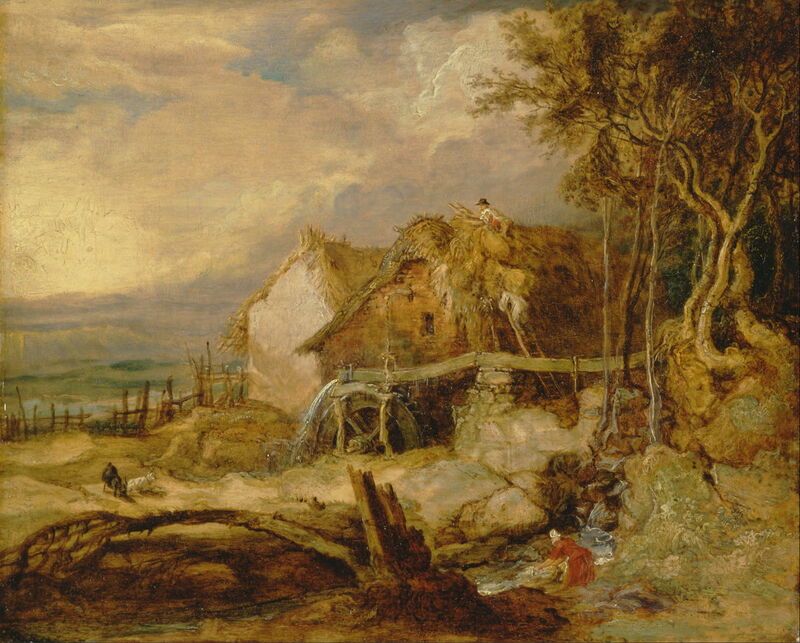 Although it is often claimed that Ward shook off Morland’s influence only to succumb to that of Rubens, I think that his paintings from 1803 show his own distinctive style, which was probably more the result of his love for Dutch landscapes than of Rubens. By 1810, although his career had had its ups and downs, he was an Associate of the Royal Academy (elected in 1807 or 1808), and was cultivating a group of patrons. The next article will show examples of his mature commissions, including his most famous painting of Gordale Scar. Beckett O (1995) The Life and Work of James Ward, the Forgotten Genius, Book Guild. ISBN 978 0 8633 2948 7. Posted in General, Painting and tagged cattle, Constable, landscape, Morland, painting, sheep, Turner, Ward. Bookmark the permalink.